Received: April 14, 2017; Revised: May 12, 2017; Accepted: June 14, 2017; Published online: July 31, 2017. We previously reported that p53 plays a role as a key regulator in the tetraploid G1 checkpoint, which is activated by actin damage-induced cytokinesis blockade and then prevents uncoupled DNA replication and nuclear division without cytokinesis. In this study, we investigated a role of Skp2, which targets CDK2 inhibitor p27/Kip1, in actin damage-induced tetraploid G1 arrest. Expression of Skp2 was reduced, but p27/Kip1 was increased, after actin damage-induced cytokinesis blockade. The role of Skp2 repression in tetraploid G1 arrest was investigated by analyzing the effects of ectopic expression of Skp2. After actin damage, ectopic expression of Skp2 resulted in DNA synthesis and accumulation of multinucleated cells, and ultimately, induction of apoptosis. These results suggest that Skp2 repression is important for sustaining tetraploid G1 arrest after cytokinesis blockade and is required to prevent uncoupled DNA replication and nuclear division without cytokinesis. Cell cycle progression is regulated by checkpoint controls, which function to prevent cell cycle progression until after the completion of prior events (1). The G1 checkpoint permits DNA repair before its replication, whereas cell cycle arrest at the G2 checkpoint permits genomic repair before its mitotic segregation. The p53 tumor suppressor has been shown to act at both the G1 (2) and G2 (3) checkpoints. Cells lacking wild-type p53 enter the cell cycle and reduplicate their DNA without checkpoint controls resulting in polyploidy with genomic instability (4–6). The tetraploid G1 checkpoint is considered to be a general checkpoint control, which recognizes tetraploidy and induces cell cycle arrest before DNA replication (7). Actin-depolymerizing agent, dihydrocytochalasin B (DCB), which activates tetraploid G1 arrest, inhibits cytokinesis and leads to tetraploidy, but does not affect chromatid segregation (7). We previously reported that loss of p53 sensitizes tumor cells to actin damage when they are treated with actin-depolymerizing or knotting agents (8). We also previously reported molecular mechanisms underlying Bim-mediated apoptosis of p53-deficient tumor cells following actin damage (9). p53-deficient cells failed to induce p21 and could not inhibit either Cdk2 or Cdc2 kinases even after treatment with actin inhibitor (9). Those cells become multinucleate and polyploid, and eventually apoptosed, indicating that Bim-mediated apoptosis following actin damage is due to a failure to sustain tetraploid G1 arrest. This study examined the role of another cell cycle G1 regulator, Skp2, which is associated with an SCF (SKP1-CUL1-F-box protein) ubiquitin ligase complex in actin damage-induced tetraploid G1 arrest. The major target of the SCF complex is the CDK (cyclin-dependent kinase) inhibitor p27/Kip1 which inhibits CDK2 activity, and is essential for G1-S transition (10). During S phase, p27/Kip1 is degraded by the E3-ubiquitin ligase activity of SCF (11). Various types of cancer show elevated levels of Skp2 and decreased levels of p27/Kip1 (12, 13). While Skp2 overexpression facilitates cell cycle progression (14) and is associated with many human cancers, its depletion is essential for cell cycle arrest and can promote senescence (15). In this study, we report that Skp2 repression occurs after blockade of cytokinesis, effectively achieved by treatment with actin inhibitors, and further examine its role in tetraploid G1 checkpoint arrest of actin damaged cells. Actin damage leads to cytokinesis blockade and results in cell cycle arrest at G1 with tetraploidy (7). We previously reported that p53 tumor suppressor proteins play a key role in inducing and maintaining tetraploid G1 arrest following actin damage and cytokinesis block (16–18). In this study, we examined the role of Skp2 in G1 tetraploid checkpoint that arrests the tetraploid cells at G1. Skp2 is known as a key regulator in ubiquitin-dependent degradation of cell cycle regulatory proteins (19). To induce tetraploid G1 arrest, HCT116 cells were treated with PTX-2, cytochalasin D, or psychosine. After treatment with these actin inhibitors, p53-positive HCT116 cells became binucleated due to a failure in cytokinesis (Fig. 1A). Skp2 protein was reduced after PTX-2 treatment, whereas Skp1 expression was not affected (Fig. 1B). Confirmation of this effect as a generalizable phenomenon was seen with two other actin inhibitors, psychosine and cytochalasin D, and these data also demonstrated that actin cytoskeletal perturbation results in Skp2 repression (Fig. 1B). Skp2 proteins are degraded in G1-arrested cells, but its stability is increased when cells re-enter the cell cycle (20). Knockdown of Skp2 expression results in an inhibition of entry into the cell cycle S phase from G1 (19), indicating Skp2 is an important regulator of the G1-S transition of the cell cycle. We next examined the mRNA levels of Skp2 after treatment with actin inhibitor, PTX2 (Fig. 1D). Skp2 mRNA levels were significantly decreased following PTX-2 treatment, indicating that Skp2 transcription is also inhibited in actin damaged cells (Fig. 1D). Therefore, our results suggest that both protein degradation and transcriptional repression of Skp2 act in concert to ensure the inhibition of cell cycle progression from tetraploid G1 arrest following actin damage. 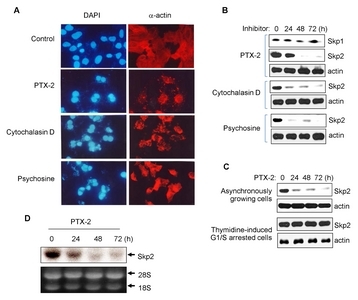 To clarify whether Skp2 repression is due to perturbation of the actin cytoskeleton, or due to cytokinesis blockade, HCT116 cells were synchronized at the early S phase by double thymidine treatment, and then treated with PTX-2 (Fig. 1C). Fig. 1D shows that Skp2 expression was reduced in asynchronously growing cells after treatment with PTX2; however, the early S-synchronized cells showed no alterations in Skp2 protein levels (Fig. 1C). Since the early S-synchronized cells did not travel through the cell cycle when they were treated with PTX2, actin damage alone is not the cause of Skp2 repression. Rather, actin damage-induced cytokinesis blockade leads to repression of Skp2 in association with tetraploid G1 arrest. Since it has been shown that p27/Kip1 acts as a cell cycle inhibitor by inactivating CDK2, but is ubiquitinated and degraded by Skp2-SCF complex, it has been considered critical for cell cycle progression from the G1 to S phase (11, 21). To investigate the effect of inactivating the Skp2-SCF complex upon actin damage, we measured the levels of Skp2-SCF target proteins, p27/Kip1 and Cyclin E. After treatment with PTX-2, the levels of p27/Kip1 and Cyclin E increased (Fig. 2). Treatment with other actin inhibitors, psychosine and cytochalasin D, also led to increases in p27/Kip1 and Cyclin E (Fig. 2), indicating that actin damage leads to inhibition of Skp2-mediated p27/Kip1 degradation. We next asked whether Skp2 repression is critical for actin damage-induced tetraploid G1 arrest by examining the effect of ectopically expressing Skp2. Skp2-expressing cells were shown to undergo DNA synthesis after treatment with PTX-2 (Fig. 3A). 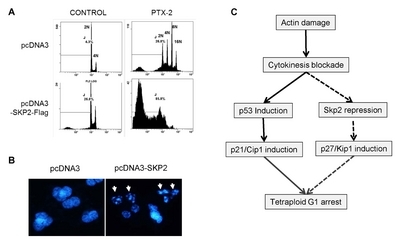 BrdU incorporation was significantly decreased after administration of PTX-2 in parental HCT116 cells, but not in the Skp2-transfected cells, implying that ectopic expression of Skp2 antagonizes actin damage-induced tetraploid G1 arrest and results in DNA replication without cytokinesis (Fig. 3A). Since uncoupled DNA replication and nuclear division without cytokinesis results in accumulation of multinucleated cells (17), we next examined nuclei in actin damaged cells. While DAPI staining showed that the majority of parental HCT116 cells arrested with two nuclei after treatment with PTX2, Skp2-expressing HCT116 cells became multinucleate, containing four or more nuclei (Fig. 3B), indicating that ectopic expression of Skp2 results in failure to sustain tetraploid arrest. Expression of p27 was induced in parallel with Skp2 repression after actin damage; however, Fig. 3C shows that p27/Kip1 was not induced in cells with ectopic expression of Skp2 (Fig. 3C), implying that p27 induction in actin damaged cells is the result of Skp2 repression. It was previously reported that DNA replication and nuclear division of actin damaged cells triggers apoptosis (8, 17). Flow cytometry showed that HCT116 cells treated with PTX2 exhibited tetraploidy (4N) and polyploidy (8N and 16N) (Fig. 4A). However, in Skp2-expressing cells, we observed apoptosis was significantly increased at the cost of an enhanced accumulation of tetraploid and polyploid cells (Fig. 4A). DAPI staining also showed apoptotic body formation after PTX2 treatment (Fig. 4B), indicating that apoptosis was induced in HCT116 cells expressing Skp2. Therefore, these results suggest that repression of Skp2, which results in inactivation of SCF-Skp2 complex, contributes to tetraploid G1 arrest of actin-damaged cells through induction of p27/Kip1 in an independent manner from the p53-p21 signaling pathway (Fig. 4C). In this study, we demonstrated actin damage-mediated Skp2 repression. Consistent with this repression (Fig. 1), Skp2 target proteins such as p27/Kip1 and cyclin E were elevated in actin damaged, tetraploid G1 arrested cells (Fig. 2), thus indicating inactivation of the Skp1-SCF complex. We previously reported that p53 is essential for actin damage-induced tetraploid G1 arrest (8). In the absence of p53, actin damaged cells cannot sustain the G1 arrest because of a failure in p21-mediated inactivation of CDK2 resulting in accumulation of multinucleated and polyploid cells, which ultimately become apoptotic (8, 17). Ectopic expression of Skp2, in a similar fashion to the loss of p53 function, causes DNA replication and nuclear division without cytokinesis after actin damage (Fig. 3). Therefore, apoptosis of actin damaged cells by overexpression of Skp2 implies that Skp2 repression is required to sustain tetraploid G1 arrest and prevent uncoupled cell cycle progression following cytokinesis blockade. We conclude, the Skp2-p27 pathway, independent from p53-p21 signaling pathway, leads the actin damaged cells to tetraploid G1 arrest (Fig. 4C). Since it has been reported that Skp2 overexpression has been found in many cancer tissues (12, 13), these results also suggest a new strategy for anti-cancer therapy; namely the use of actin inhibitors to selectively induce apoptosis in Skp2-overexpressing cancers as well as in p53-deficient cells. Human colorectal cancer cell line (HCT116) and hepatocarcinoma cell line (HepG2) were maintained in Dulbecco’s modified Eagle’s medium supplemented with 10% fetal bovine serum (Life Technologies Inc., Grand Island, NY, USA) and penicillin-streptomycin (50 U/ml). DNA transfections were performed using CaPO4 co-precipitation (Graham and van der Eb, 1973). To assess nuclear morphology, we seeded HCT116 cells on cover slips, and after allowing them to grow for 36 h, treated them with PTX-2 (10 μM), cytochalasin D (10 μM) or psychosine (50 μM) and then fixed them in Cannoid fixative (methanol/acetic acid (3:1)). After staining nuclei with DAPI (0.2 mg/ml, Sigma, St Louis, MO, USA), the distribution of binucleated cells was observed under the microscope. For DNA content analysis, 1 × 106 cells were harvested by trypsinization and fixed by rapid immersion in 1 ml cold 70% ethanol. After fixation at −20°C for at least 1 h, cells were pelleted and subsequently resuspended in 1 ml staining solution (50 μg/ml propidium iodide, 50 μg/ml RNase, 0.1% Triton X-100 in citrate buffer, pH 7.8), and analyzed with FACScan (Becton Dickinson, USA) using Lysys software (22, 23). The presented data are representative of more than three experiments. Proliferation assays were performed using a 5-Bromo-2′-deoxy-uridine Labeling and Detection Kit II (Roche, Mannheim, Germany). HCT116, p53−/−, and p53281 cells were seeded on cover slips, and then grown for 36 h before PTX-2 treatment (100 ng/ml). After 1, 2, or 3 days, cells were labeled for 1 h with 10 μM BrdU and BrdU-incorporated cells were detected according to the manufacturer’s instructions. HCT116 cells were synchronized at G1/S with a modified double thymidine block protocol as previously described (24). Cells were plated at 0.3 × 106 cells/100-mm dish and 0.1 × 106 cells/60-mm dish. After 1 day, cells were arrested by treatment with thymidine (5 mM, Sigma Corp.) for 17 h, and were then released from the arrest by washing in Dulbecco’s phosphate buffered saline and replacing with thymidine-free medium. After 9 h, cells were subjected to a second thymidine treatment to completely block the cell cycle at early S phase. Protein lysates (20 μg) were subjected to SDS–polyacrylamide gel electrophoresis and transferred to PolyScreen membranes (NEN, Boston, MA, USA). Membranes were subsequently blocked with 5% nonfat dry milk in Tris-buffered saline containing Tween-20 and probed with antibodies. The following antibodies were used in this study: antibodies against Skp1 and Skp2 (Santa Cruz Biotechnology, Santa Cruz, CA, USA); p27 (Oncogene, Boston, MA, USA); cyclin E and actin (Santa Cruz Biotechnology, Santa Cruz, CA, USA). Primary antibodies were detected with horseradish peroxidase-conjugated goat anti-mouse, goat anti-rabbit or donkey anti-goat secondary antibodies and enhanced chemiluminescence detection (Amersham, Buckinghamshire, UK). This study was supported by Basic Science Research Program through the National Research Foundation of Korea (NRF) funded by the Ministry of Education (2016R1D1A1B01007553). Fig. 4. Actin damage induced apoptotic death by ectopic expression of Skp2. (A) Flow cytometric analysis of HCT116 cells and its transfectant expressing flag-tagged Skp2 after treatment with PTX2 for 72 h. Cells were labeled with propidium iodide (PI) as described in Materials and Methods. Data representative of three independent experiments is shown. (B) Apoptotic body formation in PTX2-treated cells. HCT116 cells and its transfectant expressing Skp2 were treated with PTX2 for 72 h and apoptotic body formation (arrows) was determined by DAPI staining then photographing cells under fluorescence microscopy (×200). (C) The roles of Skp2 and p53 in actin inhibitor-induced tetraploid G1 arrest. Actin inhibitors that block cytokinesis lead to Skp2 repression as well as p53 activation. While p53 induces p21 expression, Skp2 repression induces p27 expression. Therefore, actin damage induced tetraploid G1 arrested cells have increased amounts of CDK inhibitors, p21 and p27, which act to inhibit uncoupled DNA replication and nuclear division without cytokinesis. Hartwell, LH, and Weinert, TA (1989). Checkpoints: controls that ensure the order of cell cycle events. Science. 246, 629-634. Kuerbitz, SJ, Plunkett, BS, Walsh, WV, and Kastan, MB (1992). Wild-type p53 is a cell cycle checkpoint determinant following irradiation. Proc Natl Acad Sci U S A. 89, 7491-7495. Bunz, F, Dutriaux, A, and Lengauer, C (1998). Requirement for p53 and p21 to sustain G2 arrest after DNA damage. Science. 282, 1497-1501. Lanni, JS, and Jacks, T (1998). Characterization of the p53-dependent postmitotic checkpoint following spindle disruption. Mol Cell Biol. 18, 1055-1064. Khan, S, and Wahl, G (1998). p53 and pRb prevent rereplication in response to microtubule inhibitors by mediating a reversible G1 arrest. Cancer Res. 58, 396-401. Di Leonardo, A, Khan, S, Linke, S, Greco, V, Seidita, G, and Wahl, G (1997). DNA rereplication in the presence of mitotic spindle inhibitors in human and mouse fibroblasts lacking either p53 or pRb function. Cancer Res. 57, 1013-1019. Andreassen, PR, Lohez, OD, Lacroix, FB, and Margolis, RL (2001). Tetraploid state induces p53-dependent arrest of nontransformed mammalian cells in G1. Mol Biol Cell. 12, 1315-1328. Chae, HD, Choi, TS, Kim, BM, Jung, JH, Bang, YJ, and Shin, DY (2005). Oocyte-based screening of cytokinesis inhibitors and identification of pectenotoxin-2 that induces Bim/Bax-mediated apoptosis in p53-deficient tumors. Oncogene. 24, 4813-4819. Yun, UJ, Park, HD, and Shin, DY (2006). p53 prevents immature escaping from cell cycle G2 checkpoint arrest through inhibiting cdk2-dependent NF-Y phosphorylation. Cancer Res Treat. 38, 224-228. Cheng, M, Olivier, P, and Diehl, JA (1999). The p21(Cip1) and p27(Kip1) CDK ‘inhibitors’ are essential activators of cyclin D-dependent kinases in murine fibroblasts. EMBO J. 18, 1571-1583. Carrano, AC, Eytan, E, Hershko, A, and Pagano, M (1999). SKP2 is required for ubiquitin-mediated degradation of the CDK inhibitor p27. Nat Cell Biol. 1, 193-199. Frescas, D, and Pagano, M (2008). Deregulated proteolysis by the F-box proteins SKP2 and beta-TrCP: tipping the scales of cancer. Nat Rev Cancer. 8, 438-449. Traub, F, Mengel, M, Luck, HJ, Kreipe, HH, and von Wasielewski, R (2006). Prognostic impact of Skp2 and p27 in human breast cancer. Breast Cancer Res Treat. 99, 185-191. Sutterluty, H, Chatelain, E, and Marti, A (1999). p45SKP2 promotes p27Kip1 degradation and induces S phase in quiescent cells. Nat Cell Biol. 1, 207-214. Lin, HK, Chen, Z, and Wang, G (2010). Skp2 targeting suppresses tumorigenesis by Arf-p53-independent cellular senescence. Nature. 464, 374-379. Chae, HD, Kim, SY, Park, SE, Kim, J, and Shin, DY (2012). p53 and DNA-dependent protein kinase catalytic subunit independently function in regulating actin damage-induced tetraploid G1 arrest. Exp Mol Med. 44, 236-240. Chae, H, Kim, B, Yun, U, and Shin, D (2008). Deregulation of Cdk2 causes Bim-mediated apoptosis in p53-deficient tumors following actin damage. Oncogene. 27, 4115-4121. Amati, B, and Vlach, J (1999). Kip1 meets SKP2: new links in cell-cycle control. Nat Cell Biol. 1, E91-93. Wei, W, Ayad, NG, Wan, Y, Zhang, GJ, Kirschner, MW, and Kaelin, WG (2004). Degradation of the SCF component Skp2 in cell-cycle phase G1 by the anaphase-promoting complex. Nature. 428, 194-198. Ganiatsas, S, Dow, R, Thompson, A, Schulman, B, and Germain, D (2001). A splice variant of Skp2 is retained in the cytoplasm and fails to direct cyclin D1 ubiquitination in the uterine cancer cell line SK-UT. Oncogene. 20, 3641-3650. Chae, HD, Yun, J, Bang, YJ, and Shin, DY (2004). Cdk2-dependent phosphorylation of the NF-Y transcription factor is essential for the expression of the cell cycle-regulatory genes and cell cycle G1/S and G2/M transitions. Oncogene. 23, 4084-4088. Jung, MS, Jin, DH, and Chae, HD (2004). Bcl-xL and E1B-19K proteins inhibit p53-induced irreversible growth arrest and senescence by preventing reactive oxygen species-dependent p38 activation. J Biol Chem. 279, 17765-17771. Park, M, Chae, HD, and Yun, J (2000). Constitutive activation of cyclin B1-associated cdc2 kinase overrides p53-mediated G2-M arrest. Cancer Res. 60, 542-545.